Gifted, they most certainly are; but, early reading does not always guarantee astounding achievement in high school. Last week I blogged about early readers who don’t always reach the academic potential that parents and teachers expected back in first grade. For some kids the expectations were just a wee bit too high. For others, an underlying learning disability hadn’t been diagnosed, yet. And then there’s the group of gifted kids who intuitively learned the fundamentals but still needed direct instruction in some part of the reading process before they could continue to move ahead with their learning. 43% of Lewis Terman’s Genetic Study of Genius adults (that began in the 1920s) were reading before age 5. 80% of 13- and 14-year olds who scored a 580+ on the SAT Verbal section were reading by age 5, as reported by Joyce VanTassel-Baska from College of William and Mary. 90% of profoundly gifted students (including Terence Tao) followed by Miraca Gross’ longitudinal study in Australia were reading before age 5. So, what about gifted children who were not early readers? Are they not as smart as their precocious reading friends? Is academic success not in their future? In an interview with Northwestern University’s Center for Talent Development, Dr. Nancy Robinson, a noted scholar and founder of the University of Washington’s Early Entrance Program for profoundly gifted children, frames it this way. “Early reading is clearly a sign of being at least “medium bright,” she says, before going on to note that it is not a skill exhibited by all gifted children. Some highly and profoundly gifted children are capable of becoming early readers but choose not to develop the skill. The reason may be as simple as not wanting to give up the special snuggly reading time they’ve come to enjoy with their parents – yet, that very same child goes on to graduate high school at age 14. Visual-spatial children – those who seem to learn things in whole chunks rather in a more linear, step-by-step fashion, have also been noted as late-readers. Visual-spatial children, as a group, tend to memorize whole words, rather than learn phonics skills. A number of other reasons can account for why an otherwise brilliant child may not be reading before the age of 5. The following checklist may help parents tease apart if non-early reading is part of their child’s normal developmental path. Does your child like to make rhymes or play alliteration games, where they use the same first sound for every word in a sentence? Playing with oral language like this demonstrates an inherent understanding of essential phonological skills and provides critical practice that leads to eventual reading success. Children who have had a large number of early ear infections have been found to be delayed in acquiring phonological awareness skills. This does not mean the child won’t become a successful reader, but they will need some extra help in gaining skills they missed when they were sick. Environmental print includes corporate and sports logos, street signs, and other visual images that contain print and communicates information. Children may “read” environmental print when they see a fast food sign and tell you they’re hungry for a hamburger. Such reading and responding shows us that the child understands that symbols, letters, and words communicate ideas, which allows people to interact with the world and each other. Decades of research tell us that children with a large vocabulary in their younger years tend to have higher reading achievement in middle and high school. You don’t have to count every different word your child speaks to know if they’re at that 20,000 word “rich” level. Instead, throw in the occasional big word in your own conversation. Or, read vocabulary rich picture books together. See how your child responds to unfamiliar words. Can they deduce meaning? Do they connect the new word to words or ideas they already know? Do they begin to use the word in their own vocabulary? Seeing a child use these skills lets us know they’re thinking like a reader. Reading a paragraph is very different from reading a pack of flash card words. In order to understand the paragraph, a reader must be able to sound out every word – and then remember what each word means within each sentence – and how the meaning of each sentence links together within the paragraph. That takes a lot of brain power for a 6-year old. Young children who use and understand complex spoken language show us that they have the cognitive ability to remember and access the language skills that will eventually be used when they learn to read. So, what is a complex sentence? It’s the ability to correctly execute a 3-step command at the age of 4, such as “Go upstairs. Get your shoes. And ask Dad to put them on for you.” Or, it’s the ability to listen to a story and retell the beginning, middle, and end with little or no prompting. Children who appear clumsy and knock into furniture as they walk through a room or become disoriented when surrounded by lots of visual patterns (think a busy rug pattern) may have a visual impairment, such as lazy eye, cross-eye, convergence insufficiency, or even nystagmus (a condition that causes the eyes to be in constant motion). Visual impairments do not cause dyslexia but they can make learning to read a difficult task. Treatment may be something as simple as an eye patch or as complex as surgery. Rarely is vision therapy the correct treatment option. For many gifted children, non-early reading is not the same as late reading. Learning to read at the typical age of 5 and 6 does not necessarily mean the gifted child will fail to thrive in school or that a learning disability exists. It may simply be that child’s “normal”. Parents with nagging concerns about reading ability should talk with their pediatrician or a reading specialist for help in gauging when to pursue testing to see if an underlying problem is holding their child back. Was your child a late reader? Did you discover a problem later on or was it developmentally normal for your kiddo? 6 types of visual impairments – their prevalence in student populations – and how the vision issues effects learning. Your go-to site for helping children learn to read. As someone who does educational testing and curriculum planning, I receive my fair share of phone calls and emails from parents who want to better understand their child’s reading ability. The concerns usually fall into 2 camps. This week I’m going to focus on questions surrounding early readers who don’t continue on as strong readers in later elementary or middle school years. Reading before the age of 5 – especially when it’s self-taught – remains a hallmark trait of high intelligence for most people. Yet, the little longitudinal research that exists on precocious readers does not find direct and assured connections between early reading skills and later high academic achievement. More often than not, most early readers who have been tracked by researchers continue to read above grade level. When compared to more typical students, however, the gap in early reading achievement closes for some gifted kids as they reach middle school. The 1st grader who had been reading at a 6th grade level may now be the 7th grader reading at the 9th grade level. Some parents of gifted children who begin to notice less stellar reading achievement abilities start to get nervous. Does my child have dyslexia? Is my kid no longer gifted? My initial answer to most parents is: No. More than likely, nothing is wrong with your child. Lower than expected achievement does not mean a child is no longer gifted. Still, a little at-home sleuthing can help parents decide if formal testing for potential learning disabilities is worth the time and money – OR – if a different approach to reading instruction may be needed. Early reading students can sometimes wow kindergarten teachers with how fast they read words. The kids have either memorized hundreds of words or mastered phonics skills that allows them to whiz through basal reader books. Yet, it’s important to remember that how we measure reading success in later grades varies from those early school years. For starters, sentences become longer and more complex in mid-elementary school. Students have to be able to remember the words and thoughts that came at the beginning of a paragraph in order to understand what they just read. It’s not unusual for students to silently re-read the same sentence more than once to make sure they get it. Slow reading does not necessarily mean there’s a reading problem. But, listening to your child read out loud can provide you with important information about how they read. Do they skip a lot of words as they read? Are they switching letters within words or substituting similar looking or sounding letters? Or, are they simply reading slowly and struggling to decode longer, unfamiliar words? The answers to these questions can shed light on whether there may be an underlying learning disablity or if your child is simply savoring the books they read. Some precocious readers seemingly “break the code” at an early age and wind up reading Harry Potter in the back of their kindergarten classroom while their age-mates struggle to sound out c-a-t. Yet, by 4th grade these same kids can’t seem to spell to save their lives. While it might seem counter-intuitive to talk about phonics with a child who’s been reading since age 4, it’s an important question to bring up. Some early readers fail to receive full phonics instruction and as a result they struggle to read complex words and/or correctly spell. Analyzing spelling errors can help pinpoint where a disconnect may lie. If problems seem to be focused on complex vowel patterns, like controlled-R and vowel digraphs like “aw”, then perhaps some targeted instruction may likely solve the problem. If the spelling problems are more universal and include mistaking even short-vowel sounds, then you may want to look at formal testing to see what underlying issues may be causing the problem. Just because a gifted child can read high-level material does not mean they can or should be reading such dense tomes all the time. Take the 11-year old who spent the summer reading through The Communist Manifesto and Adam Smith’s Wealth of Nations with a mentor – only to curl up at night with a treasured copy of The Magic Treehouse. No question existed in anyone’s mind about the child’s enthusiastic ability to understand the political and economic principles. But, you can’t ignore the fact that such reading and analysis is a taxing experience, even for adults. It’s a form of mental calisthenics that can leave a person tired and weary. Just as some people like to relax in a hot tub after a long workout, some kids like to wrap their minds in a cloak of fond reading memories. It can be a gentle reassurance of the underlying comfort that they have always found in reading. Talking to your child in a friendly way about why they choose low-level books may give you insight into whether they’re self-selecting down to a more appropriate reading challenge or just visiting with an old friend, so to speak. Many parents of gifted early readers are thrilled when their little ones pick out thick books on advanced topics at the library – but they don’t always stop to check and see how much the kids actually take away from the text. Don’t be fooled by the casual chattiness. Bright kids know how to glean lots of information by studying pictures, charts, and other graphics that fill the pages of many non-fiction books. Reading comprehension is actually a set of analytical skills that can and should be taught to gifted students. If you’re seeing inconsistent comprehension with your reader, go back to the actual book and ask them about what they read. Start by asking basic questions that cover information that is explicity stated in the text. WHO is the story about? WHEN did the story happen? WHAT happened at the end? Next, ask them thinking questions that require them to connect ideas together. HOW did someone accomplish a certain task? WHY would a certain event take place? Finally, ask evaluative questions that compel the reader to think at their deepest level. DO YOU THINK the character made the right choice? WHAT OTHER OPTIONS could have been considered? Interestingly, some younger highly gifted students initially struggle with more advanced comprehension questions. It’s not about lack of ability. Instead, they’ve come to rely on looking for black and white answers that they’re not always comfortable with the more grayscale areas. Early reading indicates at least a moderate level of giftedness, but it does not always lead to a life-long passion for reading or even to high academic achievement. Some gifted kids need direct instruction to help them continue to excel with their reading abilities. Others may have an underlying learning disability that requires different instructional methods. And, of course, there will always be the children who have no problems. They are right where they should be academically. Do you have a highly or profoundly gifted child who isn’t reading, yet – and kindergarten is right around the corner? Check out Part 2 of the Early Reading Myth and Gifted Children. Was your child an early reader? This blog post is part of the HoagiesGifed July Blog Hop. 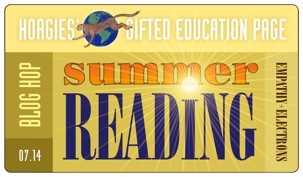 Visit Hoagies’ Blog Hop home page to read more about (summer) reading and gifted children, written by other professionals and parents of gifted kids. Using the story of Cinderella, learn how you ask different types of comprehension questions to tap higher order thinking. Fill your summer reading lists with Newberry award winning classics, loads of chapter books, and even fiction books for your math lover. A few curricular products that may help you help your child improve their reading.